For the second consecutive year, Delaware County EMS has been recognized for the care it provides to heart attack patients. 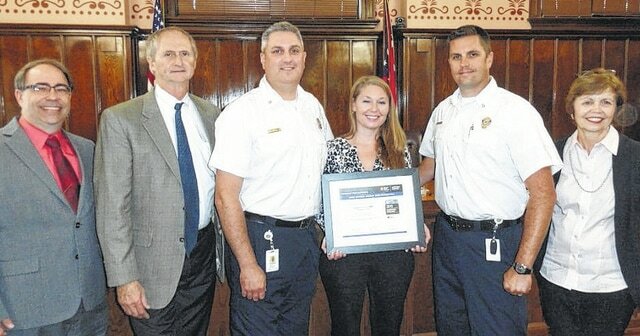 The organization once again received the American Heart Association’s Mission: Lifeline EMS Bronze Award. “It not only looks at the service we provide at Delaware County EMS, but it also takes into account the services that we provide in conjunction with the hospitals,” said Assistant Chief Eric Burgess. The award is based on the organization’s care for patients who suffer a severe heart attack known as a STEMI (ST Elevation Myocardial Infarction), which is caused by a complete blockage of blood flow to the heart. Nearly 300,000 people across the country experience a STEMI heart attack each year. Effective treatment requires the restoration of blood flow as quickly as possible. “Unfortunately, a significant number don’t receive adequate blood flow in time. Mission: Lifeline’s EMS recognition program recognizes those emergency responders for their efforts in improving STEMI systems of care and improving the quality of life for these patients and we are proud to accept this award on behalf of our patients and responders,” said Chief Mike Schuiling of Delaware County EMS. The recognition puts Delaware County EMS in the top 2 percent of all emergency medical service agencies in the country. Just 422 of the 19,000 agencies across the U.S. received the recognition for 2014.